Now Where Is That Track? 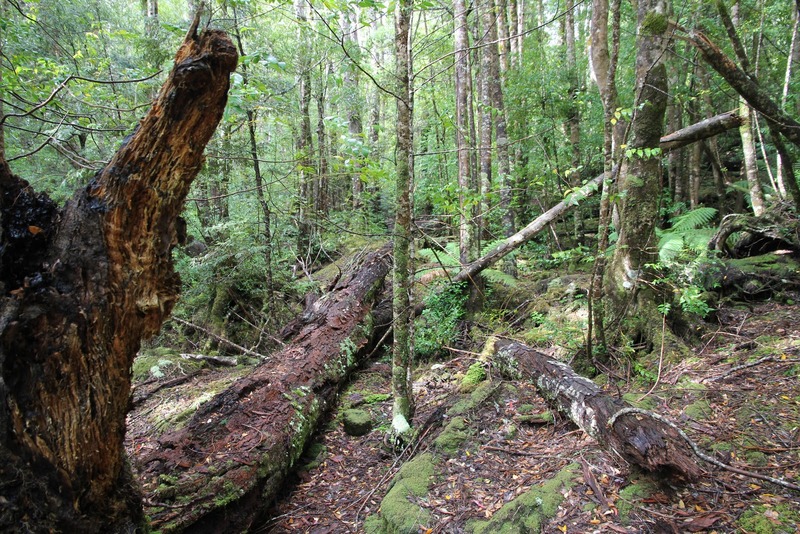 A relatively open bit of Tasmanian scrub. Never Truly Lost is what Paddy Pallin, pioneer bushwalker and outdoor gear maker, entitled his 1987 memoir. More than 3 decades later, with the advent of GPS, PLB, EPIRB and SPOT*, you might almost believe that Paddy’s wry boast was achievable by any bushwalker. Going off track in Tasmania’s scrub should convince you otherwise. Scrub is no respecter of technology. I discovered this in the early day of GPS, when a techy friend and I went for a day walk in the Southern Ranges. Wandering off track in search of lyre birds, we entrusted our location to the small electronic brick that my friend had carted up the steep slope. The beauty of this GPS, he told me, was that it would tell us exactly where we were, when used in conjunction with a map. Eventually, finding ourselves suitably lost, we fired up the device. For some minutes it scanned the sky for satellites, eventually finding enough to reveal exactly where we were. We soon confirmed on the topographic map that we were precisely 300 metres west of the marked track. The simple solution would be to walk 300 metres east, and voila! we’d find the track. True enough, but the problem was that the intervening 300 metres was dense south-west scrub. On that occasion the scrub was kind, and it took less than half and hour to get back on track. On other occasions I’ve been less fortunate. Once I spent more than four hours “walking” about 400 metres uphill to a known and visible destination – a banksia tree marking the end of a band of scrub. We had “misplaced” the track, but because we could see where we needed to be, we assumed that pushing through the scrub would be the best tactic. It wasn’t. Carrying full packs into a wall of bauera, tea-tree and horizontal scrub, we did everything we could to make headway. We crawled; we rolled; we flung ourselves bodily into the scrub; we even climbed metres above the ground on see-sawing branches, feebly imitating Tarzan and Jane. We stumbled, fell, became covered in scratches and bruises, and wore botanical specimens from head to toe. We cursed, swore, laughed, kicked, screamed and cried, and I came the closest I have ever come on a bushwalk to choosing to lie down and die. Try it for four hours and see if you don’t feel the same! Somehow we eventually broke through to the banksia. We gave it a feeble hug before falling to the earth for a long, breathless, wordless rest. This all happened before GPS was a twinkle in some military mind’s eye. But GPS would not have been any help. We knew where we were, we just (almost) couldn’t physically get to where we needed to be. As the same Paddy Pallin observed "in the bush, the problems of life are no longer complex." Perhaps not, but they certainly can be stark.